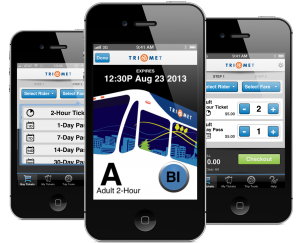 The TriMet Tickets mobile ticketing app proves an overwhelming success in its first week. As of 12:30 p.m. on Wednesday, Sept. 11, more than 21,700 mobile tickets and passes have been sold, generating more than $100,000 in sales. There have been more than 16,000 downloads of the free app. Despite the enthusiasm, we’re still finding people who haven’t heard about the device, so help us spread the word: The TriMet Tickets app makes buying and using tickets as easy as a few taps on the screen. Buy TriMet tickets anytime, anywhere! 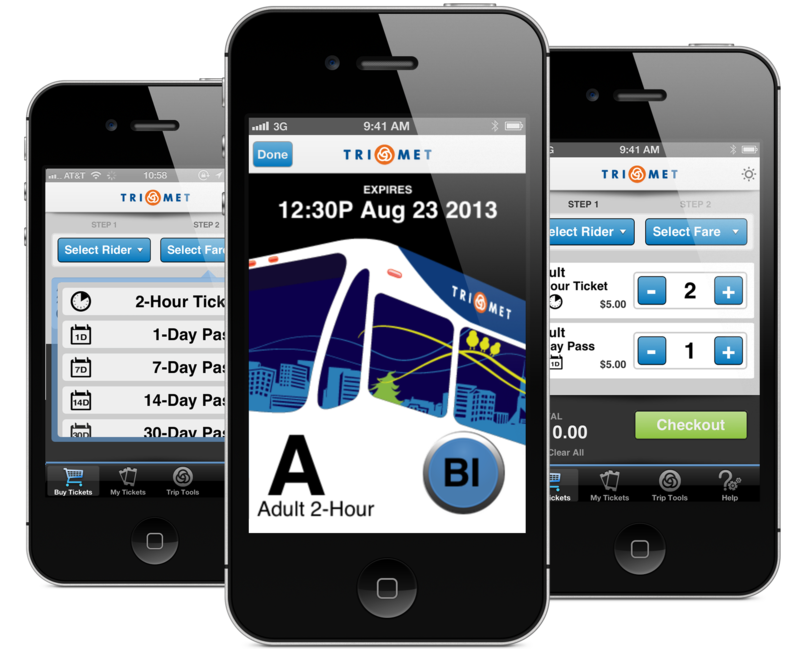 The TriMet Tickets app allows you to purchase TriMet fares on your Apple or Android smartphone anywhere, at any time. With just a few taps, you choose your fare and checkout. The ticket pops up in your “My Tickets” tab in just seconds. TriMet partnered with local software developer GlobeSherpa to create the app, the first to be used in the U.S. for riding both buses and trains. Using your ticket or pass is just as easy as purchasing it. Just launch the app, go to the “My Tickets” tab and press “Use” for the ticket you want to display. Be sure to validate the ticket BEFORE entering a MAX platform where fares are required. Elsewhere you can wait until you see your bus or train approaching, but you are required to validate before boarding. Show your phone screen to the operator as you get on the bus or to TriMet personnel or Transit Police officers when requested. If you have an Apple or Android smartphone, go to the app store and search for TriMet Tickets. Download the free app, create your account, select fare type and then register your debit or credit card. You’re now ready to start buying and riding paper free! There is a $5 minimum due to card transaction fees. The mobile tickets are animated, with the expiration date, fare type, and the day code displayed. TriMet personnel may ask you to verify your ticket by tapping on any of the windows of the bus. This turns on the lights inside the bus on the ticket. TriMet personnel may also ask you to tap the blue button in the bottom right corner of the ticket. This launches a QR code that can then be scanned using a fare enforcement application. The code contains pertinent data regarding scan status, validation time, ticket type and location. You are required to show a valid fare when using TriMet, so keep track of your phone and make sure your battery won’t run out while you are riding. Many MAX platforms are fare-required zones, meaning you need to validate your mobile ticket before entering the platform. The TriMet mobile fares are valid on the Portland Streetcar, but the Streetcar’s new mobile tickets are not valid on TriMet vehicles because the Streetcar’s $1 fare does not cover the cost of a TriMet fare. With a $5 minimum purchase required, consider purchasing a Day Pass. It is the same price as two 2-hour tickets and is a great value that lets you ride throughout the day. You need a wireless or network connection to buy tickets, but once you make the purchase, the tickets are storied in your phone for use at any time. TriMet paid no upfront costs for the development of the TriMet Tickets app. We expect the mobile ticketing app to save the agency millions of dollars by reducing the cost of ticket processing and cash transactions. The app also brings TriMet one step closer to a state-of-the-art electronic fare collection system that will eventually provide all riders – not just those with smartphones – with easy and convenient ways to pay their fare. Learn more about eFares. Learn more information about the TriMet Tickets app and view a how-to video at trimet.org/mobiletickets.